This post is sponsored by Florida’s Natural Orange Juice. Alright, all of you brunch-lovers out there. I have a new recipe for you today that is sure to add a little extra sunshine and sweetness to your morning gatherings. It’s wonderfully quick and easy to make. It’s bright and colorful and will make a lovely addition to any brunch table. 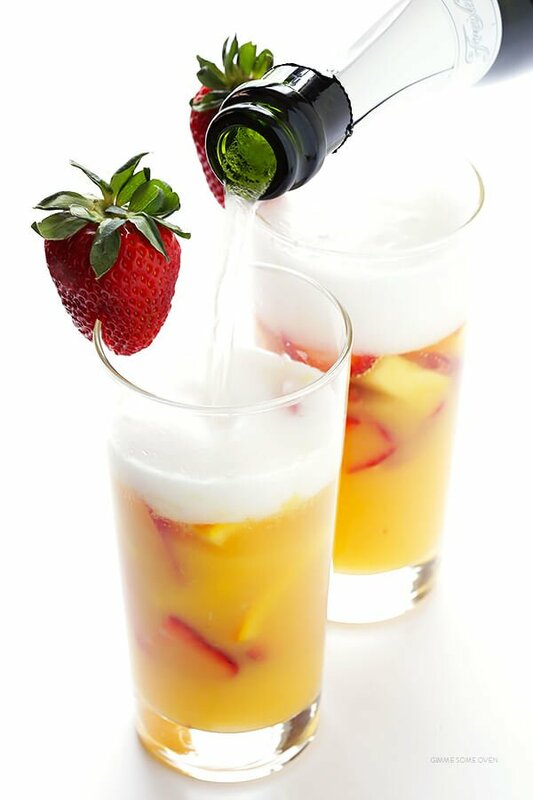 It’s naturally sweetened with all sorts of fresh fruit juices, and kicked up a notch with some bubbly for those lazy weekends. And even more perfect, the main ingredient is actually coming to you straight from the Sunshine State itself. 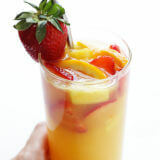 Who’s ready for a glass of mimosa sangria? …especially since today is National Mimosa Day! Without a doubt, you can’t go wrong with the classic OJ + bubbly combo. 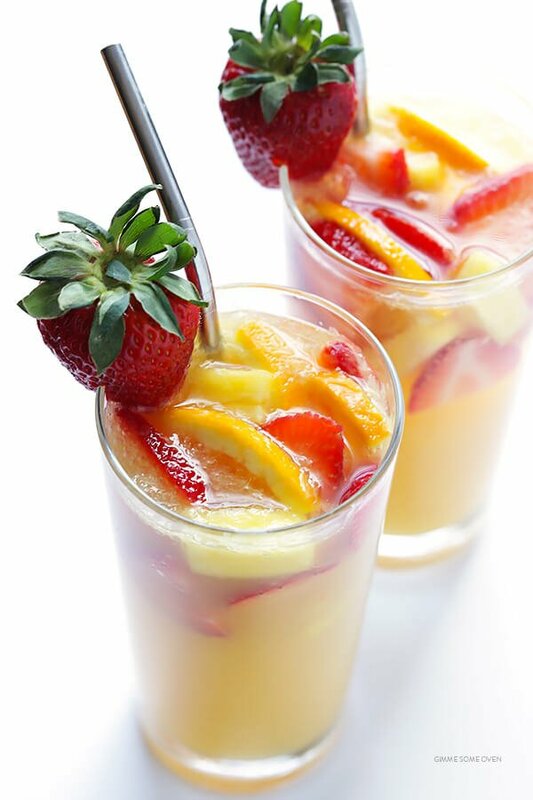 But if you’re looking for a fun “twist” on the classic, grab some fresh fruit and literally twist them into this sangria version! Just slice up a bunch of fresh strawberries, oranges and pineapple (or any fresh fruit you have on hand will do). 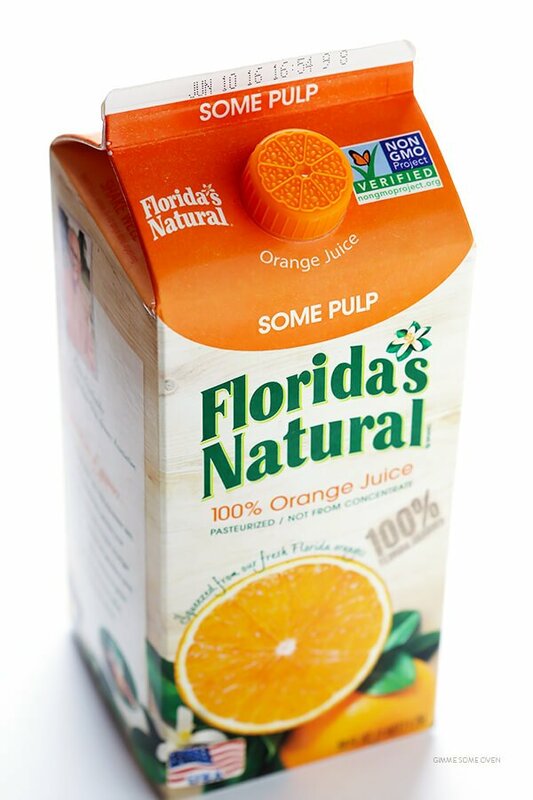 Then pour in some not-from-concentrate Florida’s Natural® Orange Juice (I went with the “Some Pulp” variety, but any will do), along with some Grand Marnier to give it a little extra kick (Cointreau or Triple Sec or any other orange liqueur). 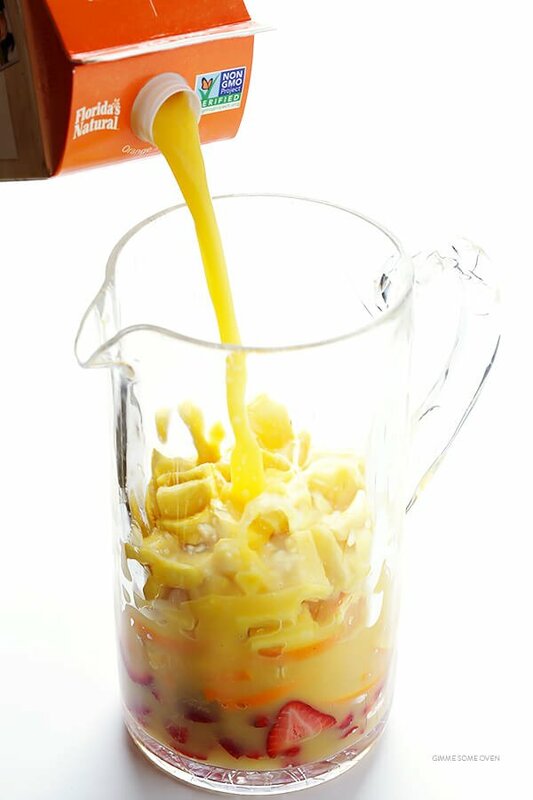 Then muddle everything together with a spoon and let the orange juice soak up all of those sweet fruity flavors. And then these gorgeous cocktails will be ready to serve! Feel free to tinker around with the recipe however you’d like — making them more or less boozy, subbing in whatever fresh fruits (or even frozen fruits you’ve thawed) that you have on hand, garnishing them with more fruit or umbrellas or whatever looks cute. The orange juice and bubbly are really your main priorities here. So grab a bottle of your favorite dry sparkling wine or champagne (doesn’t have to be expensive), a fresh carton of not-from concentrate Florida’s Natural Orange Juice, and you really can’t go wrong with the rest. 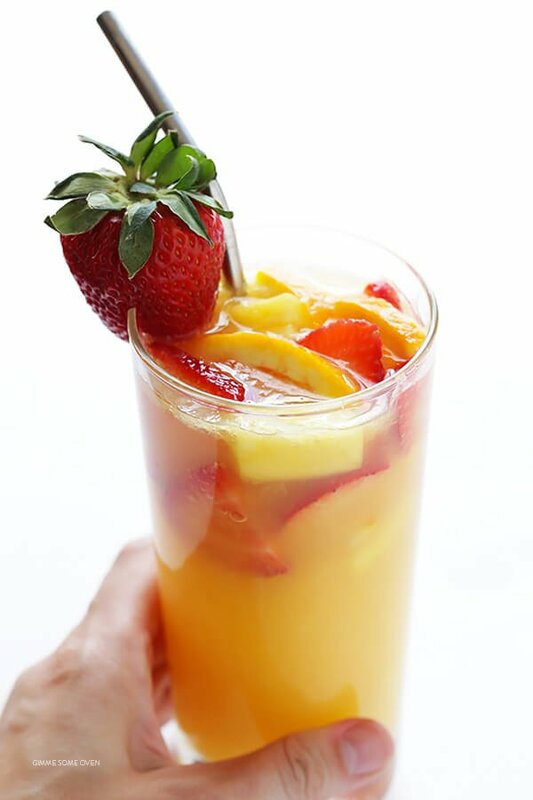 This mimosa sangria recipe is easy to make, chocked full of fresh fruit, and so refreshing and delicious! 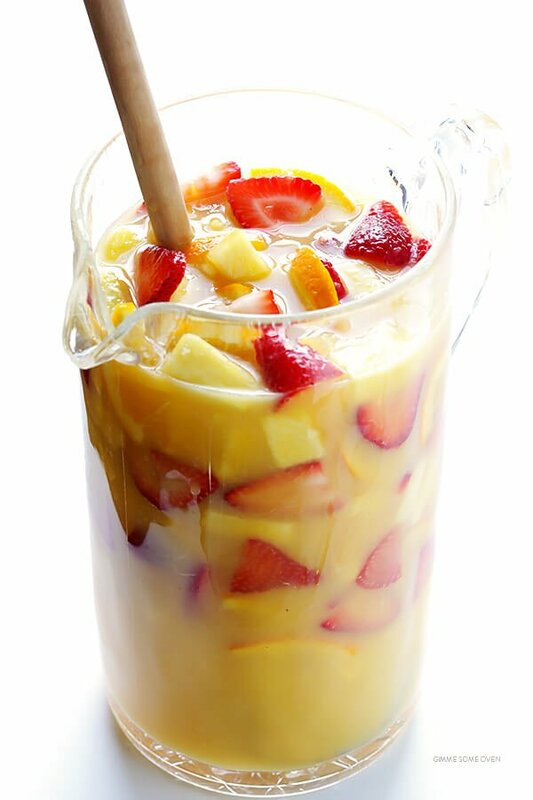 Combine the orange juice, Cointreau (or any orange liqueuer), orange, strawberries, and pineapple together in a large pitcher. Use a large wooden spoon to stir and muddle the fruit a bit. Then refrigerate the juice for at least 10 minutes, or up to 2 hours. When ready to serve, fill the serving glasses 1/3 full of the orange juice and fruit mixture. Then slowly top each glass with champagne until full, adding extra ice if needed and garnishing each glass with a strawberry if desired. This is a sponsored post in partnership with Florida’s Natural Orange Juice. I’m teaming up with them to share some tasty new recipes this year inspired by their delicious not-from-concentrate orange juice which is grown by American farmers in the Sunshine State — delicious!